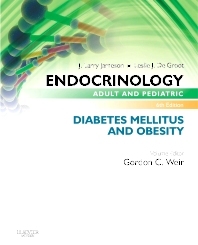 Meet the growing challenges of diabetes and obesity management with Endocrinology: Adult and Pediatric: Diabetes Mellitus and Obesity - a new diabetes and obesity eBook from the same expert endocrinologists responsible for the highly acclaimed two-volume Endocrinology clinical reference. With all of the latest advances loaded on your favorite eReader, you’ll be able to put today’s best practices to work for your patients. Stay abreast of the newest knowledge and advances in diabetes mellitus and obesity, including today’s increased focus on controlling autoimmunity and preserving or replenishing beta-cell mass in the management of type 1 diabetes; complications of diabetes and their pathogenesis, morbidity, and treatment; new findings and treatments for obesity; and much more. Count on all the authority that has made Endocrinology, 6th Edition, edited by Drs. Jameson and DeGroot, the go-to clinical reference for endocrinologists worldwide.